A strange thing happened to me tonight as I read through the blogs I follow on my reader. Someone I have come to know very well, and for whom I have the greatest admiration for, was obviously having a very hard time. In fact, as I was reading this post my husband walked in to find tears streaming down my face. At that moment, at trying to explain what ‘was wrong,’ I came to a startling realisation. For the first time in many long years I have found, here in cyberspace, on Word Press, a group of people who have become friends. In fact they are very dear friends, and this has happened without my being consciously aware of it. The realisation was, for me, quite momentous. I have spent the better part of my adult life without friends. There had been several reasons. My ex was a police officer and many people find that confronting. They were polite, to a point, but really didn’t want to socialise. Then there were those who wanted to believe the worst of any police officer, and his family, during the Fitzgerald Corruption hearings, and as you can imagine some very cruel things were said. He had a phobia about retiring and finding he was penniless and so everything we had earned whilst working went into our home and investments. We owned our home but our family life had been – somewhat lacking. Holidays were something we dreamed of as everyone went away over the summer holidays. Still, they couldn’t know this but it was said that ‘he must be corrupt because we owned our home’. Cruel, senseless and divisive. It was needlessly cruel towards our children and for that I despised, with a fierce intensity, those people. Then later there were those people who had professed to be friends and evaporated like a summer breeze the moment my ex husband and I separated. It felt like I had contracted some unknown contagion and I felt more isolated than ever. I was asked recently when I had built a wall around myself. It took a while for me to follow the thought back, inside myself, and to realise when it had begun. This protection mechanism to prevent the feelings of hurt and rejection. I had an image to protect, that of the competent no-nonsense individual who could do anything, despite the difficulties. It was a persona which had developed over many years and for those who have read my posts about Voice Dialogue and Sub Personalities you will recognise this was “The Protector”. However, I have moved on and against the odds I have met and married a wonderful caring man, someone who takes the time to understand the complexities of my nature. I am daily grateful for this miracle. Yet he has also done more than allow me to love freely again. He has allowed that shield I erected to start to come down. I have extended myself to others and been accepted. I have found people who are genuine, who wish me well and whom I have come to care for deeply. Should anything happen to these people I would feel all the grief one would normally feel at the loss of a close friend or family member. 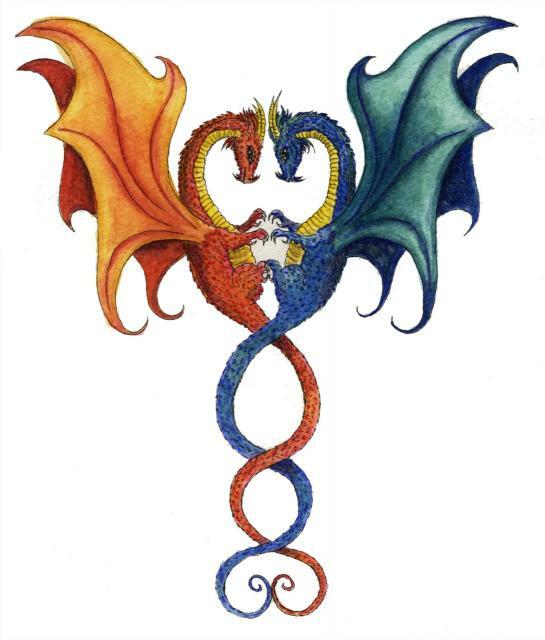 image from http://www.hbdragon.com Lives entwined. This may seem like a small thing for some. It may seem trite to others. Yet I have learned that friendship is one of the most important things we can give to each other. The knowledge that we need not put on a face to shield how we feel from them and that they will still offer support, an ear to hear you or kind words to help you knit those fraying emotions together again. It means, very simply, that no-one need ever feel alone because feeling alone, feeling isolated and misunderstood is corrosive to our hearts and souls. Our spirit is damaged by the isolation from other spirits, from other spirits in human form as we are here on earth. So, to all those who I have come to value through my interaction with you, I offer you my friendship, a delight in your creativity, an empathy in your difficult times, and a joy in your happiness. As much as people crave love, friendship is the glue to make or lives a glowing beacon. I wish everyone, true friendship, and my heartfelt thanks for allowing me to reclaim this wonderful feeling. Thank you. Be well, be supported, receive friendship and happiness, and smile at least once a day. I’m certainly hearing you about being in the police at that time and what happens when a couple splits up Susan. I have very few friends, some acquaintances and then there are people like yourself who I correspond with. There some that are people at the end of a keyboard and others who I concern myself with, you fall into the latter category. Thanks Laurie, I’m sure you will understand how much that means to me. I accept that people are ‘complicated’ but I still have this need to understand what makes them do the things they do – and try to accept that it simply is… its nothing more than something to do your head in every so often. Darling Susan, you continue to amaze me, but then, that’s who you are! Those who come to earn your friendship soon learn it is a treasure to cherish, nurture and protect, because it is so valuable and powerful and true. Through you, I have also learnt the value of friendships and those few true friends I had are now even more precious. The new friends I and we make are valued much more highly than they may have been before. Who knows? As the new business at Life Change 90 grows, perhaps we will be doing more than corresponding throufgh cyberspace with some of these wonderful people… That would truly be special…. I can also relate to your experience of having put up a wall to protect yourself… It feels great when someone comes along and is able to take it down. Such a lovely, sweet, heartfelt post, as you are yourself, Susan. Thank you for this. It warmed my heart. I’m so glad you liked it Laura, you are one of the inspirations for my Life Change. Awwww……. (sniff) you are so sweet! You make a big difference in my life too….as a very important part of my blogging Family of Choice! Wild Thang loves ya, girl. Besties – the very best thing anyone has said to me in – ever! Thank you, I feel the same way. Girlfriend you look after yourself. Susan x (The Lady in Red). I’m patiently waiting for you to get your song posted. You’re welcome for whatever you are thanking me about. LOL I’m so busy, I have so many others I need to be looking after, like you. I can’t wait till you come to the U.S. this blogging is awesome, so many new friends and I’m going to get to meet quite a few of you one day. I knew something good would come out of this, wasn’t sure what when I started this blog, but I know now. Are you feeling “ok” today? It’s 2:08 a.m. here, but I am unable to sleep because of this horrific pain and vertigo to go along with it. Thank God, I only have one appointment tomorrow and that’s physical therapy and it may be my last visit. Kinda hoping it is because it’s killing me.